The Secretary, Steve Williams, presented an illustrated talk about the pubs in Brindle over the years. Today there is just one pub left in the village – the Cavendish Arms. However, the Dog Inn on Chorley Old Road in Whittle-le-Woods was, for many years, half in Brindle and half in Whittle-le-Woods; indeed, the 1918 Electoral Roll had the pub as being in Brindle with the landlord being one Fred Shaw. Similarly, the Lord Nelson pub was for many years in Brindle up to boundary changes in the latter part of the last century. Over its door is the date 1668, which clearly pre-dates its name – British naval hero, Horatio Nelson, was killed at Trafalgar in 1805. 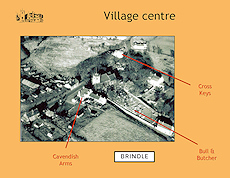 At one point there were three pubs in the centre of the village – the Cavendish Arms and the Cross Keys on Sandy Lane and the Bull & Butcher on Water Street. For many years there was a pub (more an ‘ale house’) in the row of cottages at Top o’th’ Lane, called The Farmers Arms; after the Second World War it was owned by Messrs. Matthew Brown & Co. of Blackburn, serving ‘Lion’ ale. The talk featured a few of the Landlords from the pubs, including Annie Baxendale who was ‘mine-host’ at the Cavendish Arms from 1934 until 1966; she had previously been at the Bull & Butcher (now demolished). Her relative, Harold Lancaster had the pub until retiring, whereupon he became the caretaker at Brindle Parish Institute until its closure around 1958. The Cavendish Arms reflects the connection of the village with the Cavendish family (related to the Duke of Devonshire) and owners of the Brindle Estate until between the Wars. It had previously been called the Duke of Devonshire but no dates could be found for the name change. Today the Cavendish Arms still opens its doors each day and whilst not being a ‘Rovers Return’ (like in the television soap ‘Coronation Street’), it still has a somewhat iconic status with the locals and visitors alike.